This is one addicting series. 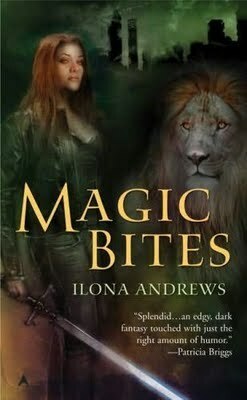 Once I picked Magic Bites up, I ended up reading all 4 released books in the series in one weekend! I liked the later books in the series better than this one, but that is probably mainly due to character development. Kate Daniels is a flippin’ awesome heroine. When we first meet her, she is chilling in her kitchen slurping down some Boone’s Farm. That is my kinda gal. There is a lot of mystery surrounding her in this book – as immersed in the supernatural world as she is, we don’t yet have a grasp on exactly what type of supe she is. We get hints here and there that it is something big and bad, but you have to read further on in the series before she spills the beans and spells it out. So, if you’re a fan of urban fantasy series than you’ll definitely need to head to the bookstore and pick Magic Bites by Ilona Andrews up. This is a great start of a fantastic series, and it only gets better from here! I’ll definitely be following Kate Daniels’ story, however long it lasts!